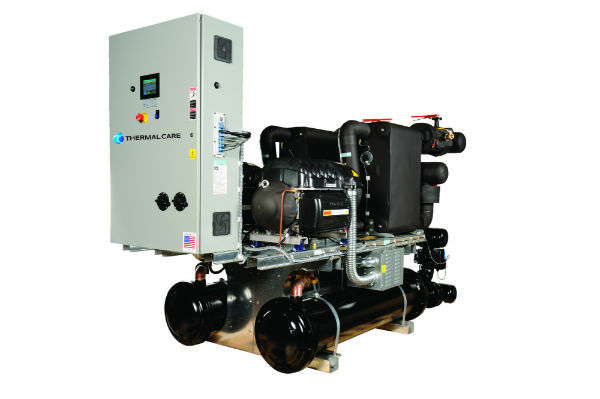 Centrifugal Chiller – Thermal Care, Inc. The main difference between centrifugal chillers and other vapor-compression chiller systems, such as screw chillers, is the type of compressor; screw chillers use a rotary screw compressor, and centrifugal chillers use a centrifugal compressor. Centrifugal chillers can be used to provided controlled cooling for a wide range of heat-producing industrial processes and laboratory equipment, such as injection molding, blow molding, metal working, cutting, welding, machine tooling, chemical processing, food and beverage processing, paper production, power generation, lasers, MRI machines and more. As such, they are used frequently by the plastics, automotive, utilities, fabrication and medical industries to name a few. Centrifugal chillers can also be used to cool and dehumidify gases, including as part of industrial air conditioning systems for moderate to large size facilities. Centrifugal chillers dramatically range in size, from factory assembled chillers whose capacity is anywhere from 60 to 2,700 tons, to field-assembled chillers whose capacity can be up to 9,000 tons. Centrifugal chillers use vapor-compression refrigeration to provide their cooling effect. The chiller system pipes a coolant through its four major components: a compressor, a condenser, an expansion valve and an evaporator. Coolant that has absorbed heat from the process and has been vaporized enters into the centrifugal compressor, which increases its pressure as it moves into the confines of the condenser coil or condenser tubes. Water or air circulated through the condenser chamber cools the vapor inside the condenser and causes it to condense into a liquid. In the process, the coolant’s excess energy is released into the water or air and borne away. The coolant liquid proceeds into an expansion valve that decreases the pressure and allows for evaporation to occur. This flash evaporation that occurs at the expansion valve cools the liquid drastically. The cold fluid then moves into the evaporator, where the heat from the process is absorbed by the coolant, causing the remaining liquid coolant to evaporate and further cooling the process. A number of different coolants may be used, but water or water mixed with additives is by far the most common. The centrifugal design of these industrial chillers has a number of advantages. Centrifugal chillers have few rubbing parts, and are therefore highly efficient and easy to maintain. Centrifugal compressors do not create the highest pressure levels, but they are well suited to continuous duty applications like chilling. For these reasons centrifugal chillers are among the most popular and cost effective air cooling systems for manufacturing facilities, laboratories, schools and office buildings. Centrifugal Chiller Centrifugal chillers are a type of vapor-compression chiller that uses centrifugal motion to create pressure to drive the cooling process. The chiller's centrifugal compressor pressurizes a coolant vapor before it enters the condenser, where it is cooled by a flow of air or water.